Placer deposits have been mined in the desert regions of eastern Guatemala where very little water is available. Since conventional wet methods cannot be used to recover gold in these areas, dry methods using air have been devised. Dry concentration is much slower and less efficient than wet concentration, and can only be used with small, dry particles that can be moved by air pressure. Winnowing is the fundamental dry method. This process involves screening out all the coarse gravel, placing the fines in a blanket and tossing them in the air in a strong wind. The lighter particles are blown away by the wind and the heavier and more valuable minerals fall back onto the blanket. The weave of the blanket tends to hold fine gold. Winnowing is a very primitive method and is not used today. Perhaps the most widely used dry recovery technique is dry washing, using a dry washer. The dry washer is basically a short, waterless sluice. It separates gold from sand by pulsations of air through a porous medium. Screened gravel passes down an inclined riffle box with cross riffles. The bottom of the box consists of canvas or some other fabric. Beneath the riffle box is a bellows, which blows air in short, strong puffs through the canvas. This gives a combined shaking and classifying action to the material. The gold gravitates down to the canvas and is held by the riffles, while the waste passes over the riffles and out of the machine. A basic dry washer is composed of a frame in which a wellbraced, heavy screen is covered with burlap overlain with window or fly screen and covered with fine linen. Above this, riffles made of one-half to three-quarter-inch, half-round moulding or metal screen are placed 4 to 6 inches apart. The slope of the box varies from 4 to 6 inches per foot. If amalgamation of flour gold is desired, pockets to hold mercury are constructed in front of the riffles. A power washer of this type can process up to 21 cubic feet (approximately 0.8 cubic yards) of screened material an hour. Hand-powered washers operated by two men can process 1 or more cubic yards per 8 hours, depending on the size of the material handled. 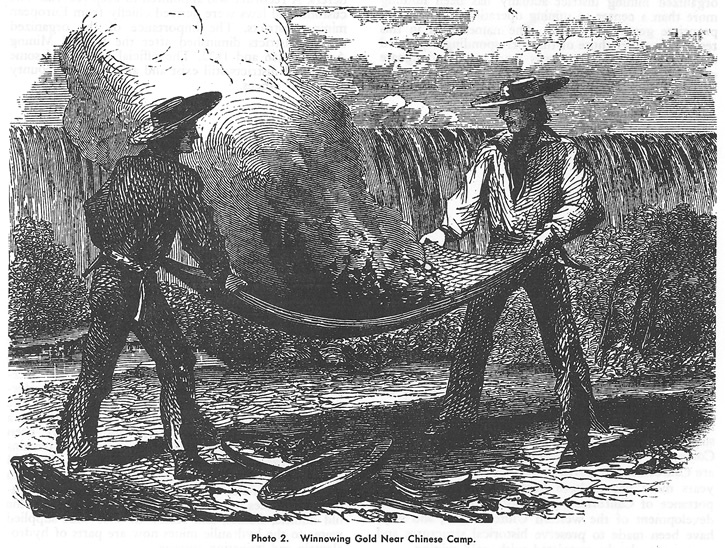 For recovery of gold, the ore must be completely dry and disintegrated. If the ore is slightly damp below the surface, it must be dried before treatment. For small-scale work, sun drying will dry material about as fast as it can be processed. In operation, dry ore is fed into the vibrating screen of the dry washer where the fines fall through to the riffles and the oversize falls off the edge. 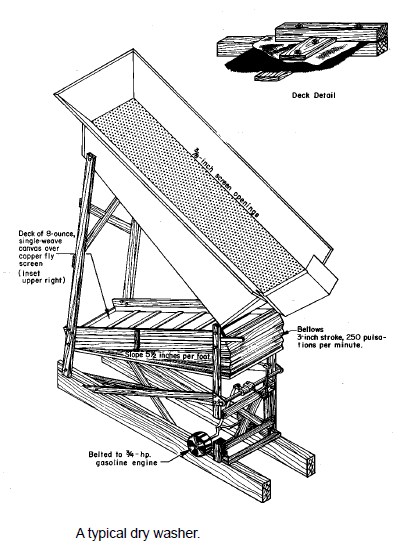 The bellows and screen are operated by hand cranking or powered by a small engine. The bellows should be operated at about 250 pulsations per minute with a stroke of about 3 inches. These figures will vary with the coarseness of processed material and the fineness of the gold. Operation continues until about one cubic yard of material has been processed. During cleanup, the riffle box is lifted out and turned over onto a large flat surface. The concentrates from the upper three riffles are first panned, and the gold removed. Usually the coarse and some fine gold can be saved here. The lower riffles may contain a few colors, but nearly all the recovered gold is caught in the upper riffles. The concentrates from the dry washer are further refined by panning or other means. If water is very scarce, the concentrates my be concentrated in the dry washer a second time and further cleaned by blowing away the lighter grains in a pan. Dry washers are portable, inexpensive, and easy to use. As with all dry placer methods, a large percentage of very fine gold is lost. Air tables use a shaking motion similar to that of shaking tables, but instead of water, air is used to separate heavy minerals. The table deck is covered with a porous material and air is blown up through the deck from a chamber underneath. The chamber equalizes the pressure from the compressor and thus ensures an even flow of air over the entire deck surface. Generally, air tables consist of a riffled top deck mounted over a base that contains a compressor. The deck is tiltable and the riffles are tapered, much like a wet shaking table. An attached motor powers the system. Dry feed is introduced at one corner of the deck. The deck is shaken laterally and air pressures are regulated to keep lighter particles suspended. The lighter material moves down slopealong the shortest route. Heavier particles move upslope due to the movement of the table. Splitters allow an adjustable middlings fraction to be collected. Idealized mineral separation on an air table or pneumatic shaking table. The sizing effects of air tables cause fine material to be lost as tailings, thus requiring careful prescreening of the ore. The feed rates, deck angles, and slopes are all adjustable for maximum separation efficiency. Air tables are capable of processing up to 7 tons per hour of feed. The Oliver gravity separator is a portable, self-contained air table suitable for use in dry placers. 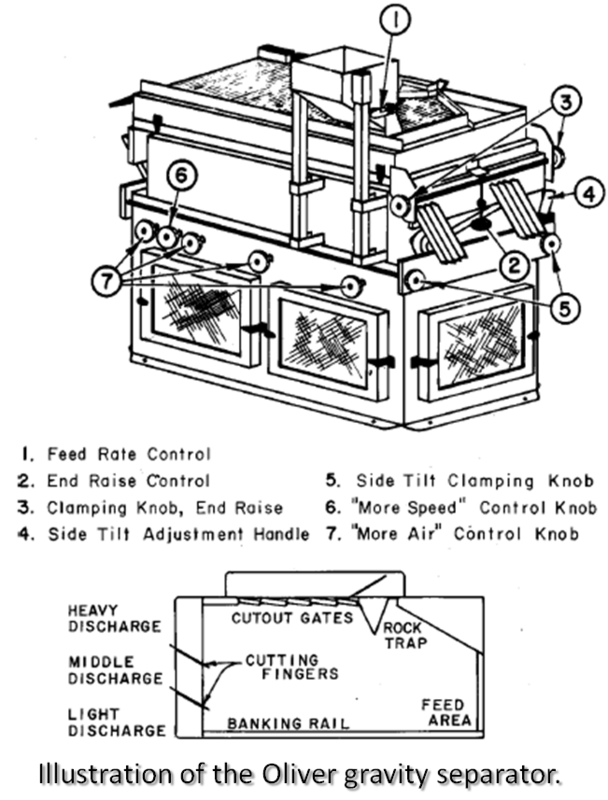 The separator is a box shaped device with a screened deck and feed box on top. The drive and air bellows are located inside the enclosed box. The deck area is 20 by 36 inches; the unit is roughly 54 inches high, 55 inches long, and 47 inches wide; it weights 555 pounds. It works by forcing air through the particle mixture so that the particles rise or fall by their relative weight to the air. The tilt of the deck and the vibrating action of the drive create a stratification of heavy materials (Figure 14). It should be noted that this device is designed for pre-processed material that should be of a very uniform particle size. The machine includes controls for adjustment of feed rate, air flow, deck tilt, and vibration speed. The unit can process up to 100 pounds of sand-sized material per hour. We have no information on the performance or separation capabilities of this machine. Not sure why this is happening. Will do what I can to resolve.